Peel the peaches and cut them in half, discard the seed. Chop the pulp into very small pieces and place in a pot with enough water to cover it all. Cook at low heat until the peach is very soft. Now you can strain the peaches to create a purée, or use an immersion blender to create a fine paste. If your child is a little older and has teeth, you can leave the pulp in. Use apples, pears or any other fruit instead of peaches. If you want to sweeten it use brown sugar, but not too much. A few grains should be enough! When my kids were babies I loved preparing their foods myself, adhering to the advise from my pediatrician of course. I started off with small amounts of pomegranate juice, then little pieces of banana, and from there we increased, little by little, until they were eating fresh fruit baby food. There's nothing I enjoyed more than making peach baby food, so fragrant and delicious, not to mention its marvelous scent. Early stimulation - which began long after my kids were babies - consists of, among other things, showing your kids to eat food of every color. Their plate of food should look like a rainbow, this way they'll be much more inclined to eat all types of food throughout their lives. 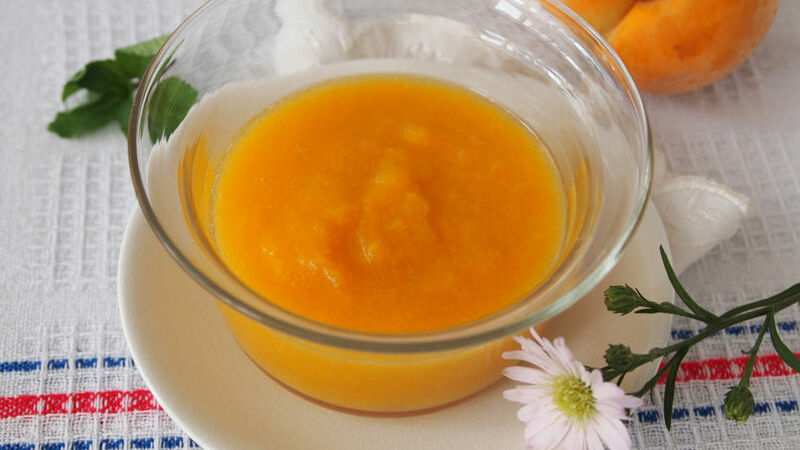 Back to the peach baby food: to make this I would buy the freshest and most aromatic peaches, I would peel them, chop the pulp into very small pieces and would then cook them with a little bit of water over low heat. At first I would strain the cooked fruit and would end up with more of a purée than a baby food. As they got older, I would leave the chunks of fruit so the baby would have something to chew on. I went from peaches to apples and then pears. Then I moved on to the veggies. I never used sugar in this recipe since they say that it’s not necessary to sweeten baby food to avoid getting them hooked on sweets at such a young age. I didn’t use honey either; it can be toxic for babies under the age of one. If you're using vegetables there's no need to add salt, many of these ingredients are naturally salty. Now you know, for a delicious and nutritious baby food, there’s no need to buy jars of processed food. They could be useful from time to time, but it's not necessarily the best option for your baby. Besides, it doesn't take much time to prepare and your baby will love it.